dog art and design comprises creative projects related to and using canines in their conception and realization. projects include pet furniture, dog-related photo essays, art installations, and design accessories. 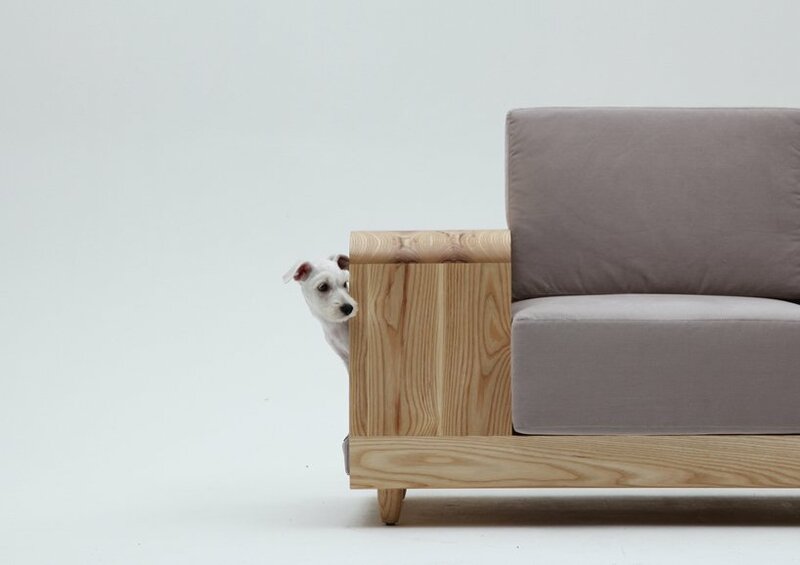 ‘the dog house sofa’ by korean designer seungji mun was conceived as m.pup‘s first line of pet furniture. as numbers of nuclear families are increasing, animals coexisting with people are establishing themselves as companions for everyday life. the furniture collection becomes a tool for interacting between humans and animals as residential spaces are becoming increasingly shared with household pets. composed of the solid ash and canvas fabric, the sofa combines a dog house into a delivery of new communal spaces for both owner and man’s best friend. He had to bribe the dog to stay in the box. Mine wants to be on top with us. In picture 6, poor little JackDoodle is looking at his owner asking if he can have his hair back. Jones.. that is his Melanoma gauge. Surprising myself, I really like this idea. It seems both sweet and clever. This design frustrates me, however. It forbids pet/human interaction. If my dog is sitting right next to me, we\’d probably both like to hang out together. Simply raising the height of the wooden arm/roof several inches so the open gap was more arm friendly could go a long way toward making this sofa more practicable. Why enclose it? It is so isolating. Maybe use clear sides and top so their is some visual contact. I think only people with dogs would understand that THIS IS PERFECT. It’s like a mini crate, where the dog is close to you but feels secure in his own space. I love it almost as much as those two pups in the photos. 1. Though the concept seems to be ok for small/tiny dogs, it would be a frustrating time for a medium/large sized dog to go under that covered little space. 2. A dog would never go from the sofa to the lower cabinet via the small little space provided below the armrest. Rather jump down and then go to the sleeping area. One can see the with what difficulty the little dog is travelling. 3. concept is ok. Looks like a normal Sofa. But a dog would never sleep in that small covered & lowered space, they would probably on top. they always want some space to spread their legs. Overall it looks quiet impracticable.